Would you entertain a second date with someone who didn’t leave a good impression the first time? Well it turns out I was wrong. I fell hard for the country I rejected on our first date. That first time was in July 2001, when, as 20-something woman, I made a 10-day solo trip to Barcelona, Granada and Seville. Gaudi, the Alhambra and the birthplace of Cervantes failed to captivate me. I was put off by what seemed like an inordinate amount of petty — and sometimes violent — crime in Barcelona, which I witnessed first hand. I didn’t engage with many Spaniards, perhaps because my Spanish then was limited to a few useful phrases. (Donde esta el servicio, por favor.) It’s not much better now, but I can readily rattle off a few more phrases now. This was also pre 9-11 and pre 2004 Madrid subway bombings — a time when free-flowing travel to top European destinations was taken for granted. Spain is, of course, still one of the top tourist destinations in the world. But the confidence that nothing can disrupt the nonstop arrival of adventurers has been shaken. Spain’s hoteliers, restaurant owners and tourist guides worked hard to win me over this time around, it seemed. I was smitten with Madrid, Toledo, Cordoba, Seville and Granada. Memories of eating pimientos de padron at the Mercado de San Miguel and the breathtaking view of the Alhambra at sunset from the Albaicin stayed with me for months. I imagined all the towns I would hit the next time around. Cadaques, San Sebastian, Malaga, Valencia. Like a boorish romantic suitor who steadily turns up the charm, Spain cast a spell the second time around, much like Jane Austen’s hero in Pride and Prejudice. Spain is my Mr. Darcy. Biere, moules et frites. Those are the specialties at Robert Wiedmaier’s ode to the Belgian roadside dive, Mussel Bar and Grille, which opened March 10 in Baltimore’s Harbor East neighborhood. The 8,000-square-foot restaurant will open at 1350 Lancaster St., home of the former Townhouse Kitchen + Bar. It will be the third outpost for Mussel Bar, which you can also find in Bethesda and Arlington, Va. In addition to its signature mussels, beer and fries, the restaurant also serves steak frites, wood-fired pizzas, fish and other seafood dishes. The RW Restaurant Group hired 75 to work at the restaurant. RW Restaurant Group also operates Marcel’s, Wildwood and Brabo. 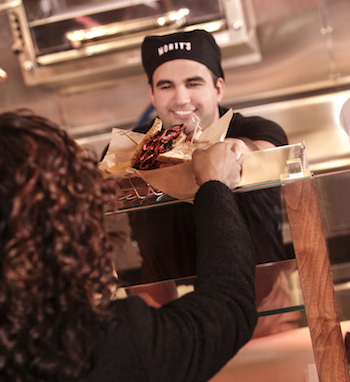 Maryland Live Casino’s newest restaurant is a New York-style deli that serves up corned beef and pastrami sandwiches. The 84-seat Morty’s Delicatessen opened in early January and is located on the casino floor, next to the Maryland Live buffet. The Papa Louie Special features turkey, roast brisket, Swiss cheese, tomato, lettuce and Russian dressing on rye while The Chairman is a double decker sandwich with turkey pastrami, beef salami, brisket, Swiss cheese, coleslaw and Russian dressing on rye. It also serves homemade soups, including matzo ball, chicken noodle and Maryland crab. It’s open for breakfast, lunch and dinner seven days a week. Folks looking to grab a sandwich in the wee hours are in luck. Morty’s stays open until 3 a.m. on weekdays and 4 a.m. on weekends. Breakfast items include egg sandwiches, omelets and bagels. Other restaurants at the casino at Arundel Mills include Luke Fu, Phillips Seafood, The Prime Rib and The Cheesecake Factory. 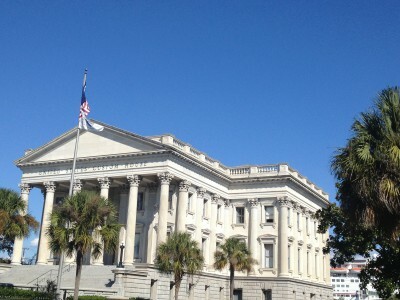 Exploring the historic streets and spicy cuisine of Charleston, S.C.
You’re a (sub)urban Maryland couple looking for a short U.S. getaway late October/early Nov. There should be a direct, nonstop flight from BWI to said destination. The locale should be at least 10 degrees warmer than Baltimore. There should be good, unique, local cuisine and plenty to do. Not a stay on the beach all day every day kinda gal and neither is DH. Do you pick a) Tampa b) Santa Fe c) Charleston. 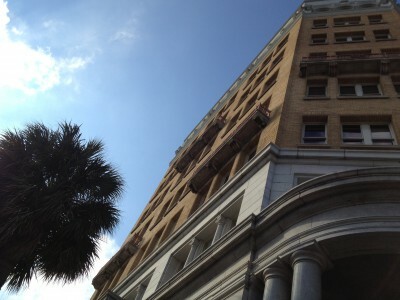 We had been to Tampa and surrounding environs (Naples, St. Petersburg, etc.) a couple of times, so it was time to try some place new. I would have picked Santa Fe, but I missed out on the Wanna Get Away fare on Southwest Airlines. As I was scrolling through the list of cities it hit me — Charleston! 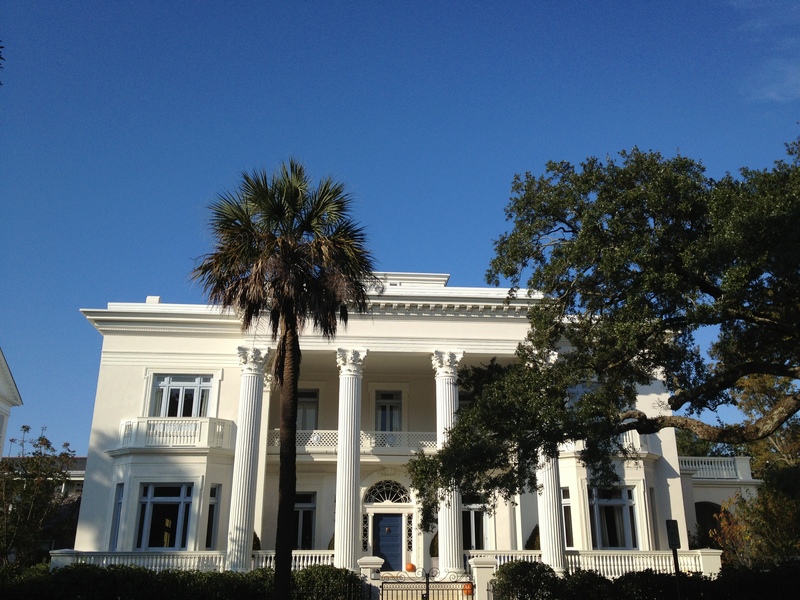 Beautiful Charleston, with its palmetto-lined streets, spicy lowcountry cuisine and eclectic blend of Greek Revival, Italianate and Georgian-style architecture, has popped up on so many Best Of travel lists but yet had somehow escaped my wanderlust. 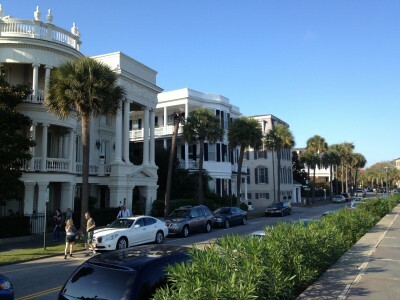 Truth is, I have found many beloved cities a tad overrated (New Orleans, I’m looking at you.) But once I discovered its charms, I was hooked. My imagination ran wild as I pictured the elegant soirées that went on behind the colorful, ornate multimillion-dollar manses. I discovered that Charleston’s historic treasures are among the best preserved not only in the nation but the world.We took a walking tour of the city with Oyster Point Historic Walking Tours , a horse and carriage ride with Old South Carriage Co., a tour of the Nathaniel Russell House Museum, and Middleton Place Plantation. Dining in Charleston was a treat for this pescatarian who asks for Sriracha even before tasting my dish. 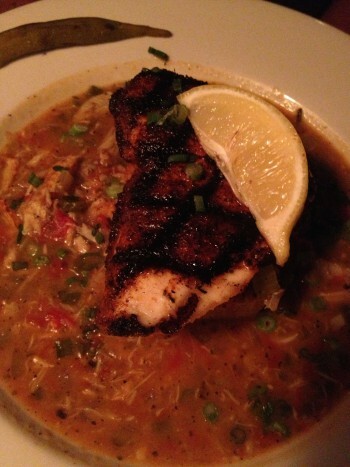 South Carolina Lowcountry cuisine is rich with a variety of seafoods and exotic influences from the Caribbean and Africa. We ate dishes like cornmeal-fried catfish with fennel sausage (OK, I eat some meat), butter beans, sweet corn and spicy tomato gravy at Blossom; fennel-dusted scallops with lima beans, leeks, shiitake mushrooms and mint at Muse Restaurant & Wine Bar; and, my absolute favorite, blackened escolar with jalapeno cornbread, blue crab etoufée and pickled okra. The food is rich. Very rich. It would have been smart for us to order one entrée and a few appetizers. But we’re not practical when it comes to food. We think with our stomachs and not our head. 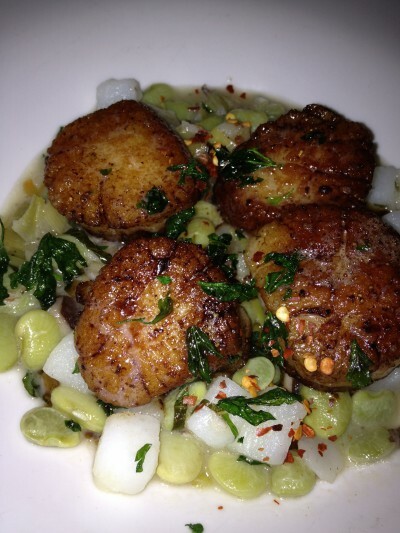 Scallops at Muse restaurant in Charleston. Fennel dusted and served on top lima beans, shitaake mushrooms, potatoes, leeks, & mint. 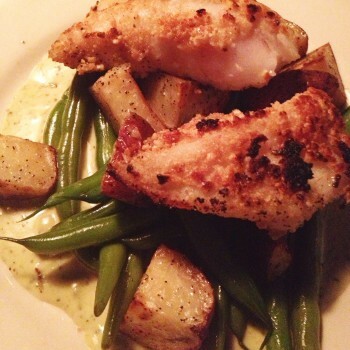 Cashew-crusted grouper with cilantro cream pesto at Coast restaurant in Charleston. Served on top of potatoes and green beans. Soon you’ll be able to slurp some oysters before listening to Beethoven in Baltimore’s Mount Vernon neighborhood. 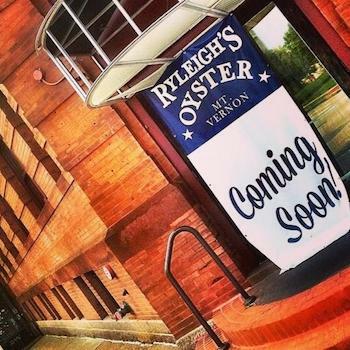 The owner of Ryleigh’s Oyster will open his third location Dec. 16 across the street from Joseph Meyerhoff Symphony Hall, home of the Baltimore Symphony Orchestra. The popular restaurant will take the spot formerly occupied by Mari Luna Mexican Bistro. Other restaurant tenants at 1225 Cathedral St. have included Robert Oliver Seafood and 23rd Degree Restaurant and Wine Bar. It was also once home to the legendary Spike & Charlie’s, co-owned by Spike Gjerde. Ryleigh’s Facebook page says the new Mount Vernon restaurant will open at 3 p.m.
Ryleigh’s Owner Brian McComas opened his second location in Timonium. 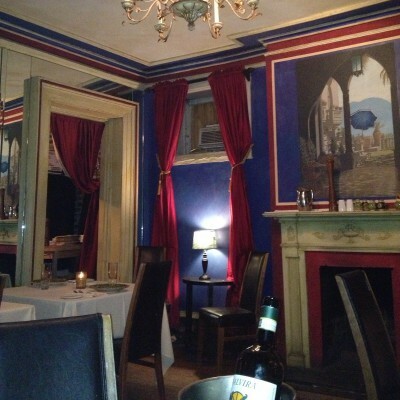 The original restaurant is on Federal Hill’s Cross Street a year ago. So the tagline for this blog is food, art and travel. 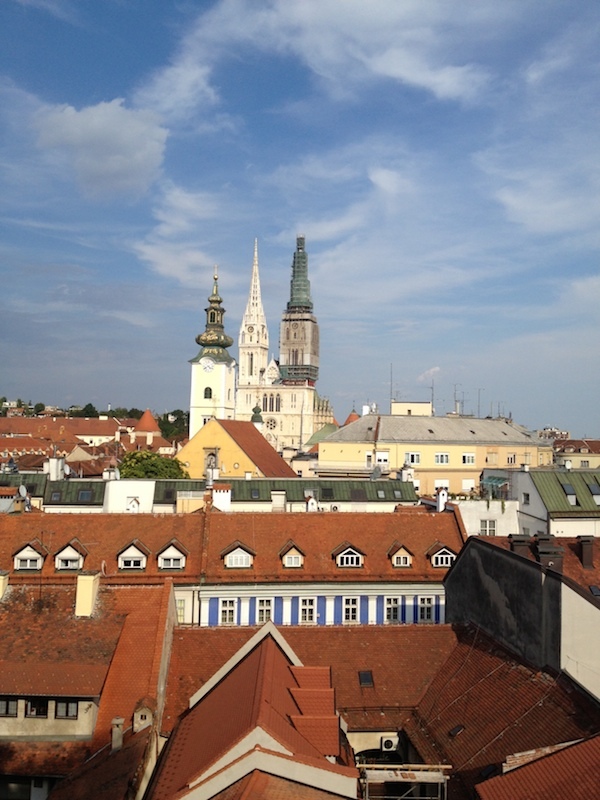 So I’d better take a short detour from my food obsession to write about my love of globetrotting, museum hopping and finding an unexpected treasure in the Museum of the City of Zagreb in Croatia’s capital. We spent two weeks in Croatia last year, starting in the walled waterfront city of Dubrovnik. We made our way up the coast to Split and Zadar, then the Plitvice Lakes in central Croatia. Finally, we ended in Zagreb. I found Croatia’s capital to be highly underrated and overlooked by travelers. But it’s full of fairytale architecture reminiscent of Prague and unique city museums. We visited three museums: The Museum of Contemporary Art, ode to heartbreak The Museum of Broken Relationships and the aforementioned city museum. 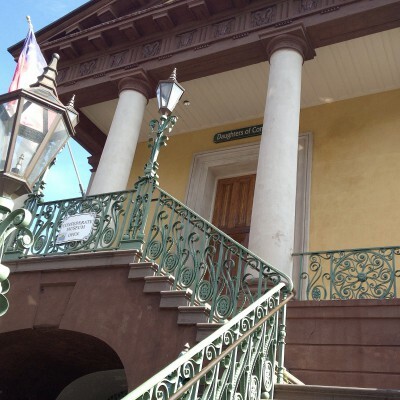 The museum is housed in a lovely restored 17th century building and offered a fascinating exhibits highlighting the history of the city and Eastern European country. 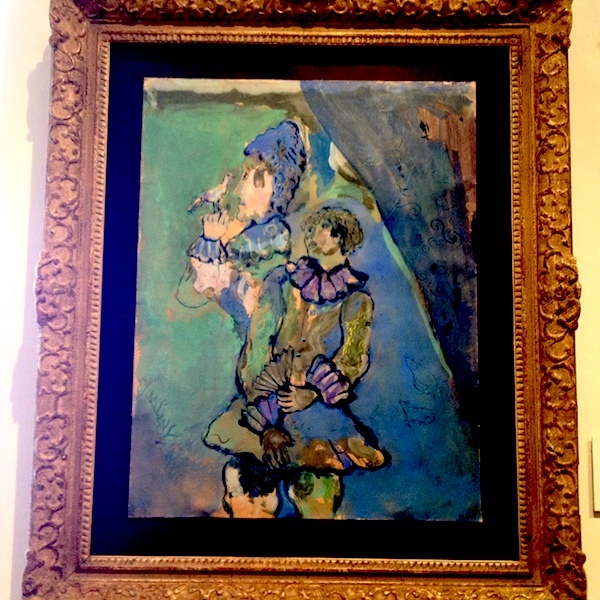 Somehow this museum came into possession of a Marc Chagall painting, “Girl With a Bird,” and I made it my mission to find it among the densely packed artifacts and artworks in this three-floor attraction. I had to scan the museum a couple of times before I found it. I love the French-Russian artist’s colorful blend of cubism and surrealism. His paintings are a more whimsical version of those of Pablo Picasso’s. “When [Henri] Matisse dies, Chagall will be the only painter left who understands what color really is” Picasso said in the 1950s. Finding the painting made our visit a scavenger hunt as well a cultural outing. The Chagall is listed as one of the Top 5 Secret Things to See in Zagreb.